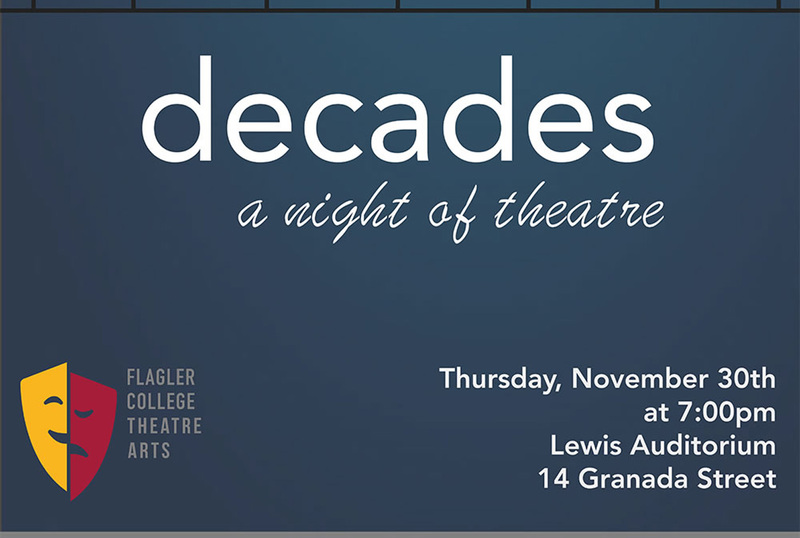 SAINT AUGUSTINE – With this fall’s Senior Conservatory theme of “Decades,” Flagler College Theatre Arts students are preparing to showcase their talents through personal accounts from the 1980s, tackling the topic of the New Millennium or overcoming obstacles millennials face. Senior Conservatory is a 6-credit, semester-long course in which senior Theatre Arts majors master all aspects of producing a show, including selecting a piece and obtaining rights, casting and directing, set construction, light and sound design, costuming, and publicity. This course acts as the senior capstone course for the Theatre Arts Department at Flagler. The Senior Conservatory Plays will be performed at the Lewis Auditorium, 14 Granada St., Nov. 30 at 7 p.m. Tickets are $5 general admission, are available online at www.flagler.edu/theatre and will only be available at the box office one hour prior to curtain on Nov. 30. The box office phone number is 904-826-8600. Senior Conservatory will feature: student Nicole Payne’s production of “Welcome to the Moon” by John Patrick Shaley; student Brian Mathews’ production of “Only We Who Guard the Mystery Shall be Unhappy” by Tony Kushner; and students Austin Satinsky and Kelsee Russler, the creators and directors of “Epilogues: A Song Cycle.” Their performance will showcase various music theater singers as they perform songs united by a common theme: embracing the new challenges life presents us.